Does your dad like to cook and entertain family and friends? Is he skilled on the grill and the life of the party? If so, then you're in the right place. 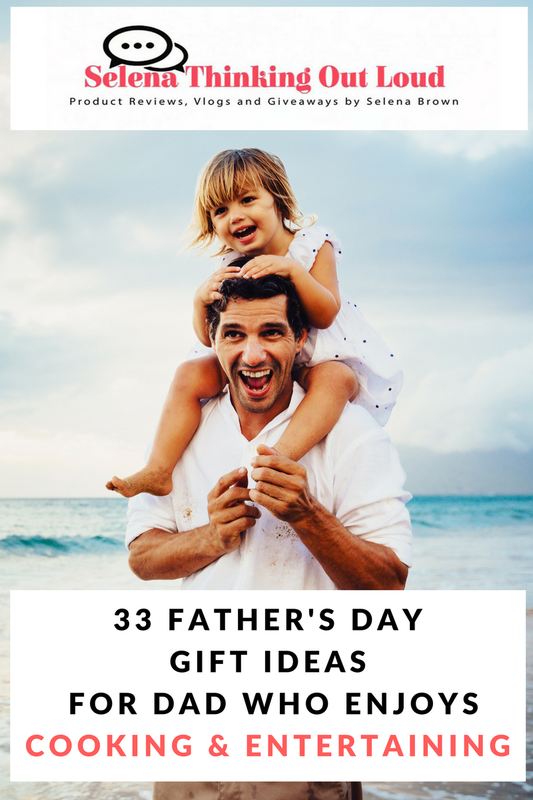 No matter your price range for gifting your dad this Father's Day, I have put together some of the best gift ideas for you. This apron is ideal for use when handling foods and is made from a blend of polyester and cotton. It will keep foods from splashing on your clothes preventing unwanted stains. Bobby Flay gets busy in his backyard, cooking up 125 new, easy-to-follow, recipes for grilling mouth-watering meat, fish, and poultry dishes. He has also included one-of-a-kind beverages and desserts. Each recipe is guaranteed to please a crowd. This is a comprehensive cookbook for any grill lover, from the novice to the experienced chef. I'm Your Favorite Child Funny Coffee Mug is made out of high quality Glass and guaranteed to last. This 13 Ounce Glass Mug is dishwasher safe and durable. It comes in a cute white gift box for safe delivery. It's a fun, unique, and creative gift. This is an all-inclusive grill tool set, perfect for cooking dense foods like steak or more delicate foods like fish or vegetables. Your dad will have the tools to handle every situation. When the barbecue is over, store the tools in the solid carrying case for safe-keeping until the next cookout. This KitchenAid Coffee Grinder has rubber feet that prevents scratches and help absorb sound while grinding coffee. The heavy-duty motor housing helps keep the grinder stable when in operation. The clear top cover is durable for years of grinding. The whole grinder is easy to clean. The bowl, blade and top cover can go straight to the dishwasher for easy cleanup. The exterior wipes clean with a soft cloth. Whether you’re a total beginner or a serious baker, Flour Water Salt Yeast has a recipe that suits your skill level and time constraints: Start with a straight dough or explore pre-ferments with a bread that uses biga or poolish. Forkish translates his obsessively honed craft into his recipes for rustic boules and Neapolitan-style pizzas, all suited for the home baker. He developed and tested all of the recipes in his home oven. Dad will get 140 recipes that are nutritious, flavor-packed, and figure-friendly. They can be prepared in a snap, whether in a slow cooker or in the oven or on the stovetop. Forks Over Knives is a book, film, and movement. Its philosophy is not about what you can’t eat, but what you can. Transform wholesome fruits, vegetables, grains, and legumes into hundreds of recipes, classic and unexpected, globally and seasonally inspired, and for every meal of the day, all through the year. When Dad's in the kitchen there is no need to fear. He has things under control and this handmade, poly/cotton twill fabric, cooking apron to protect his clothes. It also has extra-long self-ties to withstand everyday use. One size fits all. Machine Washable. This whimsical Moose Oven Mitt would be a fun addition to dad's kitchen decor. It is made of quilted cotton, ideal for light duty use and very effective for warm dishes such as taking cookies out of the oven and tea kettles. Not intended for high heat baking such as cast iron braising or broiling. Hand wash. Lay flat to dry. This cookbook has 150 simple recipes for delicious meals ranging from workout protein shakes to healthy dinners for dad to prepare for the whole family. It provides the nutritional food component of the muscle-building process. This is a 3 piece stainless steel salt and pepper shakers, a great addition to dad's kitchen. They are made from high quality stainless steel with a glass bottom that helps to verify when salt shakers are getting low, avoiding the hassle of constantly removing the cap. Hand wash only and they come with a stand for easy handling and storage needs. Can’t imagine living without cheese? I thought the same thing too! Convinced that dairy-free baked goods just don’t cut it? Hate the taste of tofu and not a fan of boring salads? EXCUSES, BE GONE! If dad's a vegan newbie, on-the-fence vegetarian, or veg-curious omnivore, this book will wipe away his doubts. You’ll find that you can get enough protein, fit in at a potluck, learn to love cauliflower, and enjoy pizza, nachos, brownies, and more, without any animal products. This unique cookbook offers over 200 mouth-watering recipes. Dad will learn the simple, savory secrets of cast iron cookery. Each unique recipe, is from cooks across the country and illustrated with four-color photography. It is published in a special flexible binding to be a keepsake treasured for many years by your dad. This kitchen board is perfect for dad when cutting up small items and great for referencing spices while cooking. Easy to Use. Simple to clean. There are more than 70 recipes to satisfy a Mad Men appetite! It provides invaluable historical and cultural context for the food and drink featured in the show, tips on throwing a successful ’60s cocktail party, and even a guide to favored Mad Men hangouts. Every recipe inside is authentic to the time period. This EVOO dispensing bottle is crafted from sturdy, solid stoneware and glazed with warm, earthy color. The 24-ounce bottle is ideal for adding extra virgin olive oil to warm bruschetta, poached fish, savory pasta dishes and other culinary favorites. The design merges everyday functionality with a touch of rustic, antiqued character, and relaxed style for dad's kitchen or tabletop. These hand painted, sculpted ceramic salt and pepper shakers are both fun and functional for dad. Packaged in a full color gift box, this set makes the perfect gift for the ultimate Star Wars dad. Hand wash.
Yotam Ottolenghi and Sami Tamimi explore the vibrant cuisine of their home city—with its diverse Muslim, Jewish, and Christian communities. This cookbook has 120 recipes from their unique cross-cultural perspective, from inventive vegetable dishes to sweet, rich desserts. There are more than 300 recipes, fast to prepare (start to finish in 45 minutes or less), 500 are gluten-free, and 250 are vegan and are all highlighted with icons on the pages. The flavorful, vegetarian recipes cover hearty vegetable mains, rice and grains, beans and soy as well as soups, appetizers, snacks, and salads. This soap is perfect for your dad if he enjoys drinking beer or he has his own homebrewer. The beer soap comes in 6 difference scents and are made with IPA beer and ground hops, giving it a spicy, herbal, and earthy scent. Dad will enjoy serving this gift basket of sausages, cheese, and crackers to his guests or as a starter before dinner. Your Dad will enjoy this savory, sweet and crunchy, snack assorted gift basket. Delicious nuts included are: Roasted and salted Mixed Nuts, Smoked Almonds, Pistachios in the Shell, Roasted Salted Cashews, Butter Toffee Peanuts, and spicy Jungle Snack Mix. Snacks included are: Berry Cherry Trail Mix, Cheddar-Asiago Cheese Crisps, Honey Sesame Sticks and savory Rice Cracker Mix. It is packed in a reusable seagrass basket and tied with a bow for festive gift presentation. There is enough for 8-10 people for snacking. Dad can infuse his favorite meats with smoky flavors of Cherry, Hickory, and Apple Wood. Each wood chip bag contains enough chips to fill the smoker box and is ideal for smoking recipes under two hours. This cooking gift set includes everything he needs to set up his grill for smoking his favorite meats, fish, and veggies. It includes easy step-by-step illustrated instructions, recommended pairings, and their favorite recipes. This kit can be used on a gas or charcoal grill. Dad will enjoy serving his guests gourmet summer smoked sausages, cheeses, crackers, pretzels, and mustard while entertaining or before dinner. To use this Coffee Brewing Set, your Dad just has to fill it with his desired amount of coffee grounds. (medium ground will work best). Then fill the kettle with hot water in a circular motion. It should take about a minute and a half for a 5-ounce cup of coffee to finish dripping. Then he can enjoy his cup of coffee! If your dad always wanted to make his own pasta dishes, this Pasta Machine is for him. It rolls and cuts pasta dough for making traditional Italian pasta at home. It wipes clean with a dry brush or cloth after each use. Included with the Pasta Machine is:a pasta cutter, hand crank, clamp, complete instructions and a 10-year manufacturer's warranty. Your dad will like this compact gourmet grill because it's portable, heats up very quickly, and uses far less gas than a full-sized grill. It can cook meals wherever he go - the beach, the game, the campsite, etc. The folding legs, grill lid latch, generous carry handle, and the spill resistant drip tray all enhance its portability. It is large enough to cook most family meals, for example: 8 steaks, 8 hamburgers, 6 - 10 chicken breasts, or over 4-Pound of fish. This Precision Cooker heats and circulates the water to a precise temperature, cooking food to an exact temperature which creates maximum tenderness and moisture retention, without the worry of overcooking your food. It will connect to your dad's phone, so he can cook meals by the touch of a button and spend less time hanging around, waiting in the kitchen, by relying on the app to notify him when his food is ready to eat. To use this gadget, attach the cooker to any water-filled pot, put your food in a sealable bag, and set the time and temperature. This is a portable propane grill, perfect for your dad if he like to grill a lot and spend time outdoors in nature. It is 10,500 BTU and has a 225 square inch cooking surface, with a porcelainized cast iron cooking grid. It also has a circular SS burner, push ignition, folding legs, and a removable grease tray. When in doubt you can never go wrong with a gift card. Then your dad can choose exactly what he wants for his kitchen. You choose the value for the Amazon eGift Card and it will be sent directly to your dad via email. This Amazon Gift Card will be shipped to your dad in a single, physical, tin Gift Box.